Fridays are ambitious in this part of the world. They flow and ebb to the mood swings of the Box Office. Over the years, the weekends have gained notoriety for being merciless. That’s Bollywood for you! Somewhere in the 80’s era, when our heroes were battling tyrannical Thakurs and their ilk, redemption was close at hand. Generation next survived a cult called music videos and video jockeys. MTV was here to stay. Two entertainment mediums happily co-existed for the longest period. They crossed paths frequently, but the relationship was a non-committal ‘just friends’. And then the inevitable happened. Cut to the new millennium; content was crowned the undisputed king (or Queen as the current BO success). Two resilient entertainment biggies decided to have an open relationship. And that, as they say, was the backstory. Here I was at an Indiblogger meet showcasing an MTV film produced by Anurag Basu. Yes, Fridays in my part of the world are ambitious, indeed! The movie opens with the protagonist’s father, Benjamin Gilani, sitting at the breakfast table. A stressed heart patient, whose radio station 97.5 Real FM, is currently in losses. His 22 year old daughter, Rhea (Malhaar Rathod) is effervescent, and has two besties, Natasha (Preetika Chawla) and Saloni (Abir Abrar). Natasha has a sister Akanksha (Veera Saxena) who she does not get along with. And this forms their gang of girls. By now, I had the premise figured. Elementary, my dear Watson! So, yeah, the story goes that the staff who haven’t got a raise, quit. Rhea’s dad gets a heart attack; she and her friends have just 5 hours to salvage the situation. Transmission begins at 7 am, and it also happens to be 15th August, our Independence Day. The girls come up with a unique idea of showcasing regional music from every Indian state, live in the studio. How do they manage to work controls? Sri Sri Google-shwar comes to their rescue. And in this day and age of networking and reality shows, you ought to know someone, from some community, who can sing (and dance). They even manage to take the radio to the streets by shooting interviews of general public, asking them for their opinions on the world’s largest democracy. And yes, the girls pull off the impossible and we get our fairy tale ending. Ta Dah! But wait, this was just the synopsis. Let’s talk about the technicality of the film. Story : This was Life in a Metro – Dwitiya! Yes, a story about girls in a city, thrown in a catch 22 situation. It could happen to anybody. Script : Yes, Lord, YES! There was one. Hallelujah! Dialogues : Simply fantastic! No verbosity. No double meaning innuendos. Effective, to the point of reaction. Characters : They stayed back with you, the characters that is. No overpriced actors who flexed their Botox injected body parts. Simple, endearing characters, each one owning their space in the frame. My personal favourite were the ‘Bhaiya’ from Chattisgarh, the CA from Dadar and Natasha. Location : No breathtaking foreign locales, and frankly my dear, we didn’t give a damn! Commercial Cinema, sun raha hai na tu? Music : Rustic, rhythmic and soulful. No nasal twangs, and definitely no noisy instruments. In fact there were on location improvisations, as mentioned by the director, Akarsh Khurana, in a tête-à-tête. Plus One. Direction : Crisp. The student follows the master. The nuances of the film were a real showstealer. Current issues have been weaved into the script ingeniously. The lack of knowledge of there being 28 states instead of 26, vandalism, and apathy of police officers showed the sorry state of our country’s affairs. The stark difference between values and value was brought out strikingly by the lone peon who returns to his karma bhoomi. Rules that people want to break ranged from not following traffic signals to a ‘drink and drive’ initiative. Oh, one ambitious soul wanted to become a roadie. And from what I heard, most of the interviews on the road were for real, too. A heart breaking moment was when a pan stall owner said he had come to make a living in this city and was not looking for trouble. My heart even went out to that constable who said while the city partied on holidays, many like him were busy in a bandobast. Sad, but true. The CA who eventually learns to laugh at his tribe, the hooligans who find an older sister, and the police officer who gets caught in a sting operation, funny to the bone moments. MSD-LSD, Saloni’s KEY defining moment and Rhea’s opening address to the listeners of 97.5 Real FM –PRICELESS! The characters too had their upward journey chalked on the graph. Rhea achieves the impossible. Natasha sorts her differences with Akanksha. (At this point must mention, Natasha’s expressions were worth a million dollars) Saloni finds her voice. Her father (Akash Khurana) gives her the wings to fly, finally. A strong supporting actor was Rhea’s brother, who makes his ‘presence’ felt. Be it the electric cigarettes or the networking from far, he is the name without a face. No character is left mid-way. They grow on you. That reminds me, I noticed the Anti-Smoking warning in the film, only to realize, this is the ‘other’ Anurag. And last but not the least, the branding in the film. Yes, this was a film for Sunsilk, believe it or not. Yet, it was done in the most understated manner. No product mug shots, no flawless hair shining down the screen and no celebrities endorsing their favorite secret. No one was pushing me to buy anything. They just made me feel good with a sunshine story. Sunsilk came in as the Brand that takes an extraordinary story to the people, in the fag end of the story. Judging by the execution of this feel good MTV film, I’d say brand stories are here to stay. If you missed the premiere, catch the repeat telecast on Wednesday, 12 pm on MTV. Yes, it is all about girl power. Yes, it is a feel good movie. And yes, I liked it. 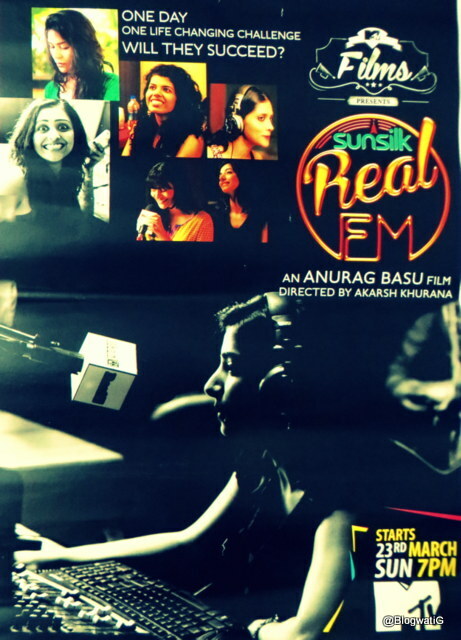 Take a bow, MTV, Anurag Basu, Akarsh Khurana & Team, and Sunsilk. Well done, indeed! And the song in the climax kind of lingered in my mind. I had to pen those words as an affirmation. For little bouts of happiness? Thanks Janu. Quite enjoyed penning this one. Very heartening that interesting subject matter and realistic cinema are being attempted and such works actually even find a release. Thanks for doing your bit for the cause! What is interesting is that a majority of the actors have theatre backgrounds. The add ons are monatge shots of real public interaction. I thought it was a very nice weave. All stories worth being told are already there. The perspective is what brings the freshness. I am hoping this becomes the norm. I am done with item songs and 6 packs! Really great shot film,after very long time i heard fresh new songs specially made for a TV film. And Malhaar… uffff she is damn good ,she is so beautiful. Loved the elaborate and detailed review. I loved the movie too..The affirmative lines at the end were bang on..